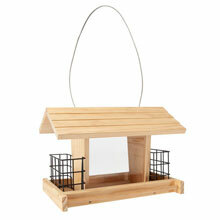 Large bird feeder with clear central hopper and 2 side suite cages. 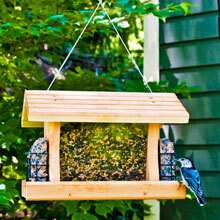 Designed to hold up to 5 pounds of feed and 2 standard size suet bars, this feeder is all you need to transform you yard or garden into a bird paradise. 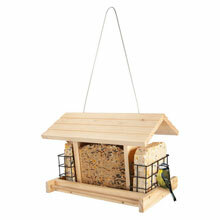 Feeder design offers a wide opening for easy filling and no spilling, and then diverts seed to the feeding area, giving bird's easy access. 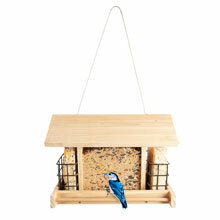 The clear, crack resistant weather shield and windows allow you to see the level of seed in the feeder and see through the feeder for better bird viewing. Vinyl coated steel hanging cable for easy hanging. 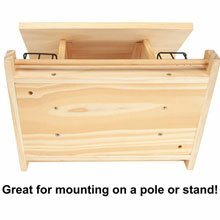 10½" wide, 7½" deep, 7½" high. 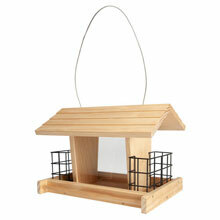 •QUALITY MATERIALS: Eco-Friendly and sustainable pine is use to make this quality bird feeder, it will weather beautifully to fit in with the natural landscape around it and will provide years or use and enjoyment. 10½" wide, 7½" deep, 7½" high. 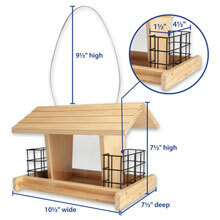 •PLENTY OF ROOM TO PERCH: Allows Extra Spacing for Large Birds and Attracts Cardinals, Grosbeaks, Titmice, Nuthatches, Chickadees, Finch, Jays, Juncos and Woodpeckers. 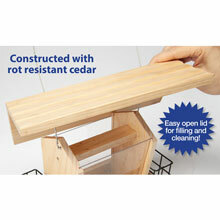 •EASY TO REFILL AND CLEAN: wide and big opening is easy to refill, and the poly carbonate window container is easy to clean. •LARGE CAPACITY: Feeder holds up to 5 pounds of seed and two standard size suet cakes, clear windows make it easy to monitor the amount of feed currently in the feeder. •READY TO HANG: Includes a vinyl coated steel hanging cable and rust free hardware, making this a breeze to hang and also take down to fill.